Agent M, do you have any idea how much that stings?? what is rong wit u sir or mam? o ya stop taking drugs!!!!!!!! what the hell is rong wit u? i'm guna laugh if u did that again!! i hope u ♥ doing!! Ouch! Glad I'm not in construction! someone I know nailed [pun intended :)] themselves in the eye with a nail gun. It seems to me that the only reason there is even a debate about the underlying thesis here is that if anybody ever tried to advance it in a substantial forum their voice would be drowned by the chorus of boomer going "La la la, can't hear you..."
I think there is no wrong in allowing someone for the use of nail gun. If he or she is aware of how to use it, and have read its tool manual carefully. Because this accidents can damage your bones seriously. A pure heart allows all others their dance and unfolding, even if the others end their incarnation in death or disease. It's not uncommon to see nails embedded in peoples skulls. These things are lethal. Seeing it in an x-ray is one thing, but is there any live video of how it happened? That would be rather intense and a little closer to reality. 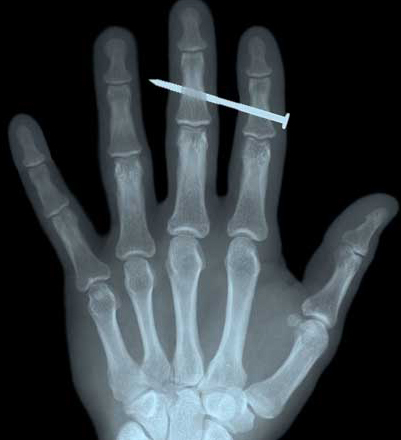 They should stop selling nail-guns to prevent this accident. lol! Are they going to have to start making people have licenses to operated this type of machinery? My goodness. Common sense, people!! hahaha you have to be a dumbass to be a victim of your own "mental disorder"...however, I agree, there are persons who should be so far from nail guns.